In This Tetris Puzzle Game, You Play With Real Player Or An AI Bot. Quadris Duels Is Not Like Other Tetris Games In Which You Match Same Color Tile To Score. 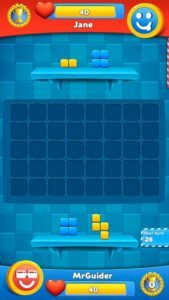 Your Goal In This Game Is To Drag Tetris Puzzle Blocks On The Board And Clear Rows Or Columns From The Board. You Can Play Online With Real Player Or Play Offline With AI Bot. You Have Only 30 Seconds To Think Where To Place Block. After 30 Seconds, You Will Lose Your Turn And Opponent Gets The Chance To Place Its Own Tetris Block. You Can Place Blocks Anywhere In Your Turn But Keep In Mind That Opponent May Get The Benefit. So, Place The Block Where Chances To Score Are Less For Opponent And High For Yours. You Just Have To Complete A Row Or Column To Score. Clearing 1 Row Or Column Deducts 5 Points Of Opponent. Similarly, If Opponent Clear Row Or Column, You Will Lose 5 Points. If Opponent Clear 1 Row, 1 Column In 1 Turn – You Will Lose 10 Points. You Have 40 Points. Player Who loses All Points First Will Lose The Game Also. It’s A Great Time Killer Game. The Game Looks Simple, But It’s A Great Fun, Time Killer, Strategic, And Addictive. This Game Is Currently In Beta/Early Access Mode Or New, So You May Miss PvP Battle. Playing With AI Bots[More Than 5] Is The Next Option. It Would Be A Great Game If You Play With Friends Offline. Price – Free[Contains Ads], Mode – Offline, Online, Size – 30 MB. Download – Here[Google Play Store].